For the first time in its 13-year history, Cornell's student-staffed fundraising phonathon raised $1 million (and counting) in a single fiscal year. The big moment came on March 18, the Thursday before spring break. At the same time last year, the phonathon had raised $601,000. 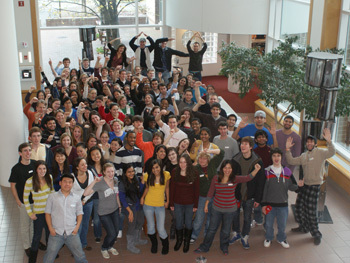 Student employees of the Big Red Phonathon gather in August 2009 at the kickoff event to the current fiscal year's effort, which passed the $1 million mark on March 18. For six nights a week, every week since August (excluding university holidays and one power outage), 30 of the 151 Big Red Phonathon employees -- all Cornell undergraduate students -- gather in a calling room in the Engineering Library in Carpenter Hall and don headsets to phone alumni, parents and friends to ask for gifts to the Cornell Annual Fund. It is an impressive operation: So far this year, Big Red Phonathon callers have logged 2,577 hours of talk time. They've completed 43,135 conversations and written more than 10,000 thank-yous -- that's a personal postcard, e-mail or letter sent to every person who has either made a gift or agreed to think about making a gift. The average commitment is $132.21, but callers have secured gifts up to $5,000. "It's the broadest personal outreach program that we have," says Maya Gasuk, director of the Annual Fund, who describes the phonathon as a two-way conversation, where the students ask for gifts, but they also answer questions, encourage visits back to campus and learn alumni opinions and updates. "There's a lot to be said for their skills as ambassadors," Gasuk says. Big Red callers have an upbeat Facebook page. They socialize outside of work. The Motivation Subcommittee, or "M Squad," plans activities to inspire callers and recruit students. Last year, they came up with a slogan: "It's not just a job, it's a lifestyle." "The room is really alive," says Phonathon Assistant David Burress, who is one of two full-time Cornell staff members, along with Phonathon Manager Jennifer Hudler, who supervise the student employees. "We've definitely had a high rate of attendance this year," Burress notes. On the Thursday they broke the $1 million mark, attendance was optional since it was the last shift before spring break, but a full staff showed up anyway. "A lot of people came into work so they could be part of it," says Burress. "The Cornell Annual Fund is ranked THIRD (it's so awesome, I had to write it out in capital letters) in university fundraising … So the question is, how can we use this on the phones to garner even more alumni support?" wrote Zein Jardaneh '11 in the Feb. 22 edition of the Cornell Annual Fund Times, a weekly newsletter by and for phonathon callers. Jardaneh's answer: "Every Cornellian loves a little bit of competition. … Just remind alums that we're third behind Stanford and Harvard and that we're trying to work our way up the rankings, and we need their help to do so." When they return from spring break, the Big Red Phonathon callers will get back on the phones, soliciting gifts for another six weeks. After passing this year's goal of $1,043,000, they will continue raising the bar for next year.